Washable,vinyl-encased-cardboard fantasy fortresses, and colorful, gimmicky transports await within! One of the key successes of the WGSH right from the get go were the ambitious playsets and vehicles that accompanied the line. 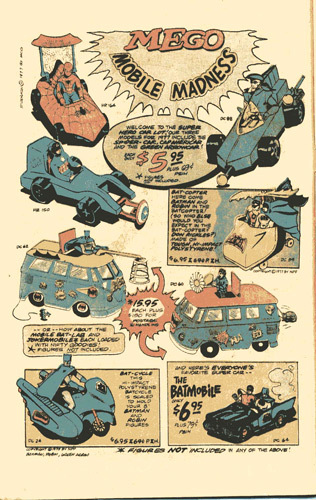 Starting in 1974, Mego reaped instant benefits from the release of the Batmobile , Batcycle and Batcaveplaysets. As the years wore on, Mego treated us to vehicles such as the Spider Car and finished with it’s coupe de gras, 1977’s towering Wayne Foundation playset. It was a good run that left us wanting more.